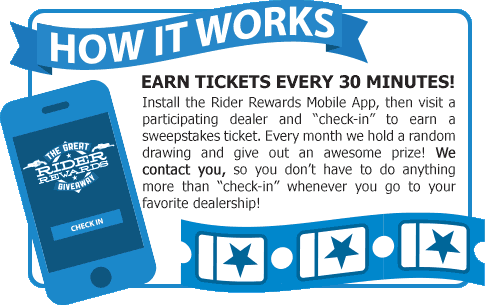 Using our free mobile app, you earn sweepstakes entries simply by “checking in” to Rider Rewards dealers. Winners are drawn randomly every month. HOW DO I LOCATE RIDER REWARDS DEALERS? Look for the Rider Rewards Giveaway logo at a dealer’s checkout counter, or download our free mobile app to try checking in! CAN I EARN MULTIPLE FREE SWEEPSTAKES TICKETS? Yes, you can check-in every half-hour. This technically allows you to earn up to 48 sweepstakes entries every day without having to purchase anything! Amazon gift cards valued up to $500 are awarded to our Rider Rewards sweepstakes winners every month! DO I NEED AN AMAZON ACCOUNT TO WIN? No, but you will need an Amazon account to claim your gift card—sign-up is free! If you're a lucky winner, a gift card code will be sent to your email address. Winners are announced every month, and they are notified via email. Winners are also posted in the "Winner's Circle" section of this website. and would like more information about offering your customers rewards for shopping at your store, check out our site made just for you. Copyright © More Than Rewards LLC. Fill out the information below and we will have a sales representative contact you.